This girl's wall quote is a customer favorite. We've seen it in many colors used in many different places (bathrooms, playrooms, walk-in closets, above beds and dressers and cribs and bookcases). I think its popularity has to do with the carefree everyday images it evokes: dancing in the rain, laughing until you cry, jamming out in the car that we all remember so well about being young. 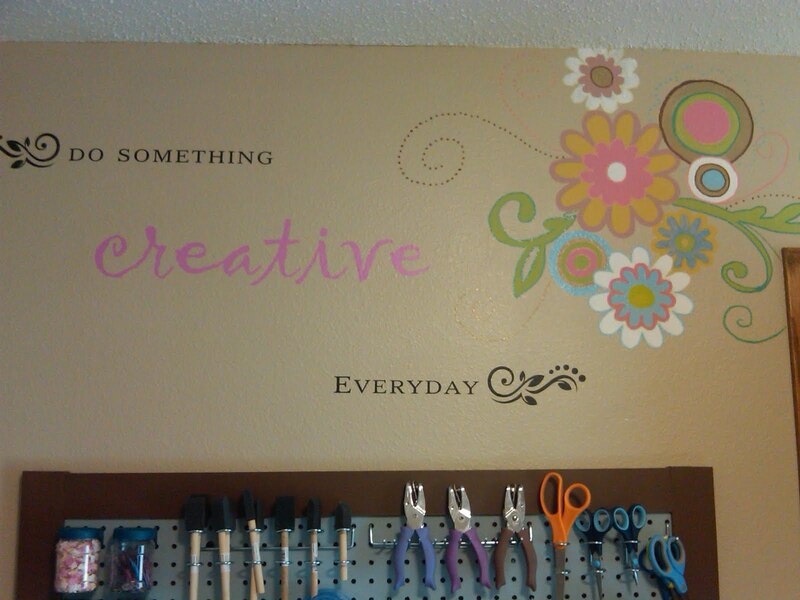 And we love how Jessica used it between this shelving - it's the perfect size to highlight this lovely quote. Congrats, Jessica. This month's $50 gift certificate is all yours! Also - remember how I said that we kept getting awesome submissions with this 'Do something creative every day' quote? I wasn't joking. Here's another fabulous one we couldn't resist. Aren't those flowers spectacular? Stacy handpainted them herself (hand painted!). And the wall quote fits in perfectly. And, even though we don't usually award runners-up, we're also sending Stacy and little somthin'-somethin' for her spectacular creativity. Wootwoot.